The Rancor Pit :: View topic - Aren't You A Little Short For A Stormtrooper? The Rancor Pit Forum Index -> Characters, Droids, and Species -> Aren't You A Little Short For A Stormtrooper? Posted: Sat May 19, 2018 11:16 am Post subject: Aren't You A Little Short For A Stormtrooper? I was wondering. Can your standard, everyday, base model stormtrooper communicate inside his helmet without being heard outside the helmet? I notice that troopers carry spare comlinks in their belts. But, this could be in case the comm in the helmet goes out. I'm thinking that, without special upgraded equipment, the standard trooper has to use a hand comlink, just as if he wasn't wearing a helmet. I base that on the movies as the troopers seem to speak out loud to coordinate instead of all of them linked in to a private channel, hearing the commands of their leader. 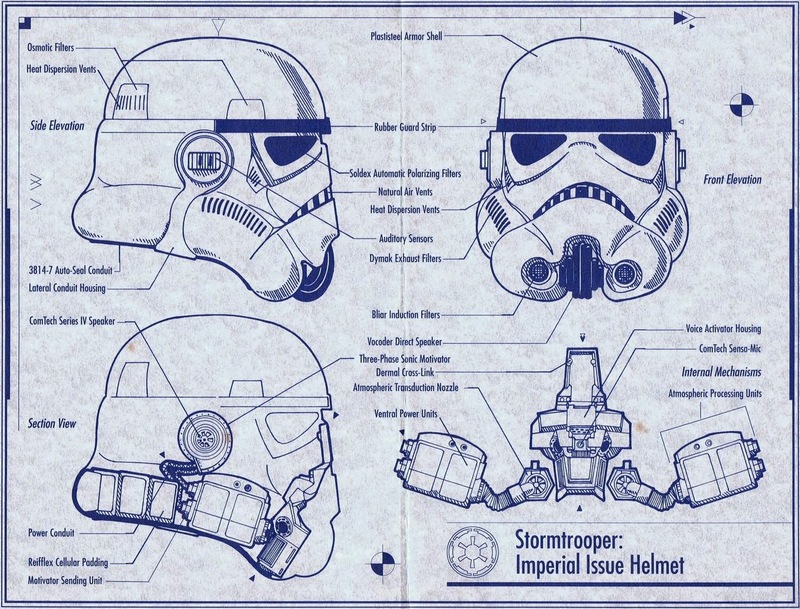 OTOH, the Sourcebook does say that, "The helmet features automatic polarized lenses and communication units that keep a stormtrooper in constant contact with his superiors." This seems to answer my question. But, the films don't seem to bear this out, thus my confusion. If the comm were inside the helmet, then the troops would not talk to each other--what they say couldn't be heard--as they approached a target. I guess most droids are like this too. I think of 3P0 in the Death Star, communicating with Luke in the trash compactor. No. The movies have never shown Stormtroopers being able to send comms without being heard outside the helmet - at least not in atmosphere. There's a possible exception with Death Troopers - they seem to default to some kind of encryption, which is still audible outside their helmets. A helmet will muffle a voice, but will not necessarily allow silent comms - you'd need something like a throat mike and bone conduction headphones for that, or cybernetics like Lobot. Now that I think about it, there is a scene in ANH that alludes to strictly in-helmet communications. When the Falcon goes into the Death Star, and Han and Luke put on stormtrooper gear. The Commander is on the com, say, "TK 421, why aren't you at your post? TK 421?" Then, one of them, Luke or Han, dressed in the trooper armor, comes out of the Falcon and indicates a problem with his helmet. The officer thinks it is a bad transmitter. This could probably be argued either way, but it seems like the Commander was only heard in TK 421's helmet--that's what pulled him off the ship and made him look at the command station and indicate the helmet. My thoughts on this. The comlink speaker is meant for the trooper alone to hear. It makes little sense for everyone around him to hear it too. Imagine how loud that would be inside a helmet. In the movies, the audience being able to hear a comm message, even an encrypted one, like the Deathroopers use, is nothing more than giving information or setting mood for a scene. If a trooper sergeant is in communication with a superior about a current situation I am sure he does not want his troopers to hear what is being said. Also, if you had a group of troopers and all of them were getting the same message, not only would it sound like a gaggle of geese, but it would be quite loud. To me it makes little sense that a comm speaker inside a trooper helmet would be heard by others. Trooper helmets have a tongue-controlled switch to change frequencies, we can assume this also allows for switching to external speaker mode for speaking only. In my games, I have updated the trooper helmet to include HUD controls for switching frequencies and switching to external speaker mode for speaking with others. As an aside it includes targeting, friend or foe, compass, GPS, basic maps, image library, temp controls, etc. As an aside it includes targeting, friend or foe, compass, GPS, basic maps, image library, temp controls, etc. I could see that with more specialized, higher trained units, but not the base grunts. Even in TFA, it seems that trooper armor is basically no frills armor. Remember the gas that Rey and Finn were going to use when they thought troopers were boarding the Falcon. For your IFF and targeting, do you give the troopers a bonus to hit? Actually, doesn't the "commander-orange pouldron) stormie bring his to hi helmet "as if getting as in an incoming message" about the time of Ben's mind trick on them??? I just re-watched the scene, and I didn't see that, unless it was covered up by the Special Edition extra nonsense. seems that commander is "turning on something" with the commander on the opposite side doing the actual speaking. Now to me this does not look like some off planet transmission, but rater where we see "comlink in helm use"
Yes, that's the original. The Special Edition covers up what you are talking about. Yeah one of them does. Do you agree this at least looks like some form of comlink activation. And given it is the guy opposite that does the talking, could we reason some form or recording or transmission or "listening in" being activated. Do you agree this at least looks like some form of comlink activation. Sure, it could be. Or, it could be the guy just straightening his helmet after a tilt. I can't tell.